If too many cancel, I'll ask Karen if I can re-teach this class at some point during the month. Ok...Yesterday I spent the day with my favorite gals the SOS cropping group. We go PSB at around 10:30 and we stay until Karen throws us out...usually about 4:30. Everyone works on what ever we need to finish and my project was the card I posted above. I am really liking these easel cards. This one was made using BoBunny's a gift of love collection. I mounted the card stock on a brown linen base. The ribbon and buttons are from Karen's collection. Actually all items are from http://paradisescrapbookboutique.typepad.com/I'm very happy with how the card turned out. I think a card similar will be taught at my next class....anyone interested in taking that class? Off I go....have a most wonderful day. Mary Mary Mary! I absolutely love this card! Such rich colors! 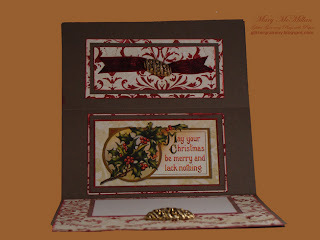 Don't you love this easel card! Did my first one yesterday and will make more I am sure! You're card is so beautiful! I hope that your first class turns out fabulous! I love teaching at Karen's store, you'll love it too...I just know it! 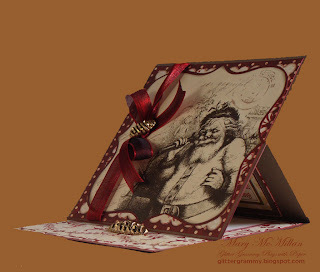 Your easel cards are gorgeous, what a neat idea! That santa card is simply beautiful!